This website is designed as a portal to the various charities and organisations which are associated with the Gospel Standard Strict Baptists. For more information about the Gospel Standard Strict Baptists see the About Us page or download the booklet 'Who are We?" A list of Gospel Standard chapels can be downloaded here. The publication of sound Christian books. To provide legal and financial assistance with Gospel Standard chapel buildings, and advice on complying with the law in other matters pertaining to the running of chapels. Provides financial assistance to those in need associated with the Gospel Standard chapels. Owns and publishes the Gospel Standard, Friendly Companion and Perception magazines. 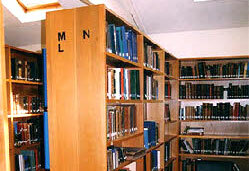 The Gospel Standard Baptist Library maintains a valuable collection of Reformed Christian books. The Gospel Standard Bethesda Fund provides care homes and warden-assisted flatlets for elderly people who are associated with Gospel Standard Chapels. The Manuscript Sermons section is a new venture between the Gospel Standard Library and the Gospel Standard Trust to put on this web site scanned copies of most of the sermons which are in the possession of the Library in manuscript form. They can be freely downloaded. The project is still ongoing and it is hoped more will be added. Comments to the Librarian are welcome. All books published by the Trust can be purchased from this web site. Information on legal matters regarding a chapel, assistance with complying with the law and help with carrying out repairs. Information about the magazines published by the Gospel Standard Society. Subscriptions can be arranged here and sample copies downloaded. Information about the Gospel Standard Bethesda care homes at Brighton, Harpenden and Studley and the warden assisted flatlets at Redhill and Harpenden. Information about the Gospel Standard Society and its charitable aims. Full details of the Gospel Standard Baptist Library. Catalogues of books can be downloaded and requests for books to borrow, free of charge, can be made. The Gospel Standard Magazine was originated by John Gadsby (1808-1893) in 1835 with the assistance and support of his father, William Gadsby (1773-1844) and is still published today. The magazine was commenced to contend for the doctrines of grace, but especially for the necessity and gracious, sanctifying effect of the work of the Holy Spirit in the hearts and lives of the Lord's people. It also advocated believer's baptism and strict communion. The circulation of the magazine grew rapidly, and in the early 1860s the editor, J. C. Philpot, gave a most gracious defence of the doctrine of the eternal Sonship of the Lord Jesus Christ, concerning which there had been many errors propagated, and which resulted in a division among the Strict Baptist churches. It was as a result of this division that many of the Strict Baptist churches began to align themselves with the Gospel Standard magazine, and over the years have become known as Gospel Standard Baptists. For more detailed information see the About Us page.